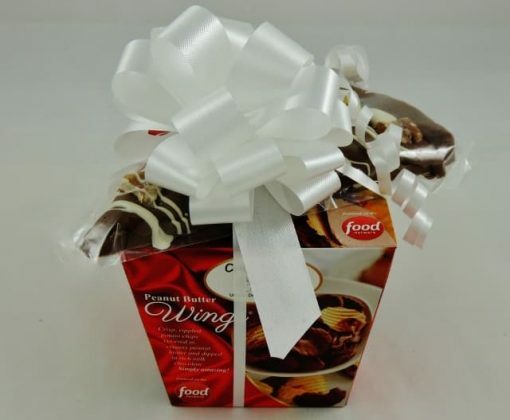 “Slice & Wings Combo” is one of our best-selling gift ideas. We pair Peanut Butter Wings in milk or dark chocolate and in 8 oz or 16 oz sizes with your choice of one of our best selling Chocolate Pizza Slices (6 oz) and wrap it in colorful ribbon. Perfect for teacher or office gifts, great for a house-warming hello, hostess gift or anytime you need to say “thank-you”. 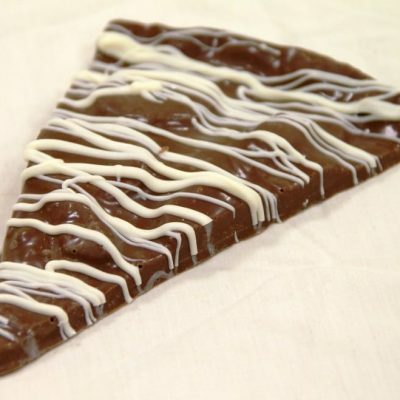 Chocolate Pizza Slices – milk or dark chocolate – are available topped with chocolate candies or peanut butter cups/candies or nuts (pecans, almonds, walnuts). The Candy Avalanche Slice is available in milk chocolate and comes loaded with chocolate and peanut butter candy favorites for a small additional charge. 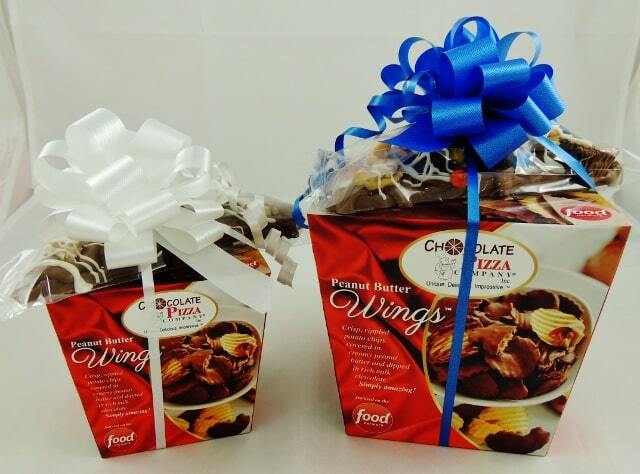 Combo Slice Chocolate Pizza and Peanut Butter Wings is a gift choice that is just right for so many occasions. It also makes a nice holiday gift or hostess gift. It starts with a slice of our delicious Chocolate Pizza with its blend of gourmet chocolate and homemade English toffee and your choice of toppings. Wrapped in clear cello the Chocolate Pizza Slice sits atop a container of our famous Peanut Butter Wings. 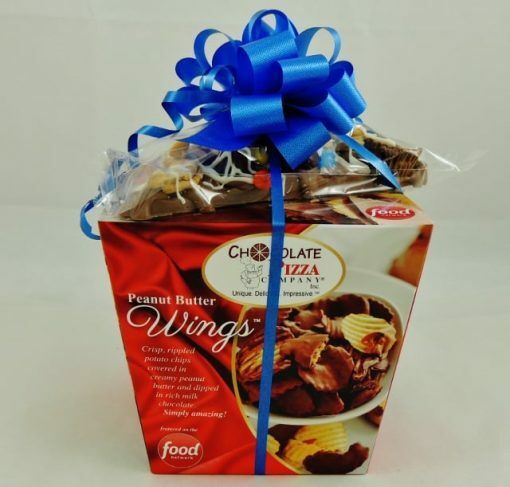 Those Wings are crisp, rippled potato chips covered in creamy peanut butter and drenched in rich chocolate for a one-of-a-kind taste masterpiece. 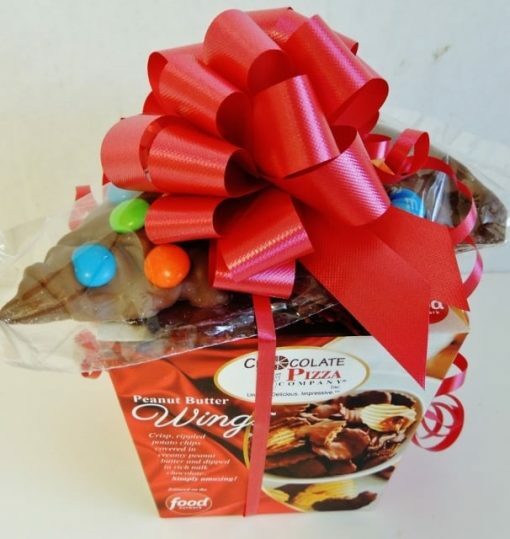 Add a big bow and together you have a Combo Slice Chocolate Pizza Slice and Peanut Butter Wings. It’s the perfect something to give for any occasion or no occasion. So thank you or happy birthday or congratulations or get well soon with a Combo Slice Chocolate Pizza and Peanut Butter Wings. Featured on Food Network and NBC’s Today Show, Chocolate Pizza Company has been creating handcrafted, gourmet chocolate specialties here in America for nearly 30 years. 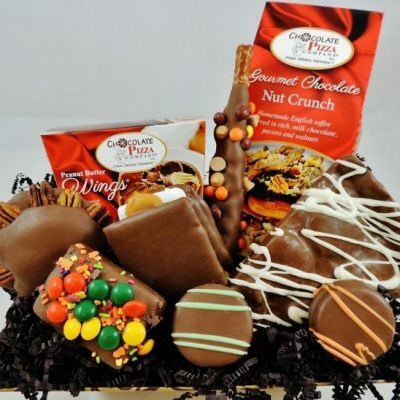 Our unique, delicious and impressive chocolate confections are the ideal gift for birthdays, holidays, anniversaries, graduations, weddings or any special occasion. 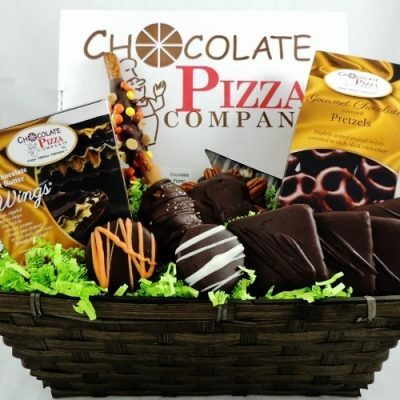 A gift from Chocolate Pizza Company is guaranteed to brighten someone’s day and have them raving about the amazing chocolate they just received. 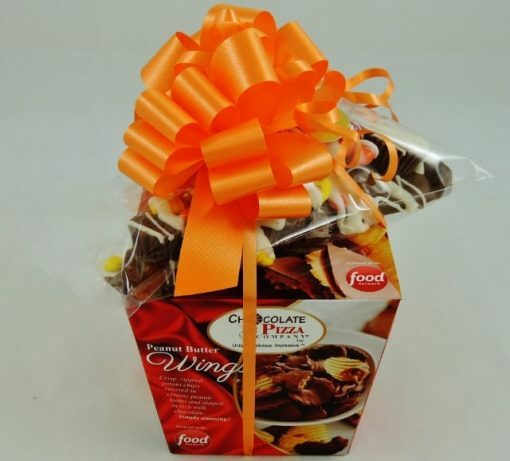 So the next time you are searching for that unique gift, look no farther than where you are – Chocolate Pizza Company! Whether it is a Chocolate Pizza Slice and Peanut Butter Wings Combo or a beautifully presented gift basket or Chocolate Tower or Chocolate Pizza, you will find all of our line ready to impress. Remember, we make our chocolate treats here in America, with skilled chocolatiers who have a passion for what they do. Every treat that leaves our facility is fresh, handcrafted and ready to make a wonderful impression.